The GXV3240 by Grandstream replaces the GXP2200. It offers 6 lines with up to 6 SIP accounts, dual switched, auto-sensing 10/100/1000Mbps network ports, WiFi, PoE+, Bluetooth, and a 4.3" capacitive TFT LCD touchscreen, HD wideband audio. The GXV3240 runs on Android 4.2, offering full access to the Google Play Store. This allows the use of thousands of business productivity apps, such as Skype, Microsoft Lync, Salesforce1, and GoToMeeting. 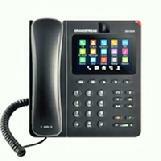 The phone features Gigabit ports, HD audio and HD video, a built-in web browser, integrated Wi-Fi for network flexibility, PoE, and a tiltable CMOS camera. The GXV3240 is compatible with the GXP2200 Extension Module, allowing for quick and easy access to up to 160 contacts at the touch of a finger. The GXV3240’s integrated Bluetooth allows users to sync the calendar and contact books on their mobile phones with the GXV3240, to use Bluetooth headsets, and to transfer calls to and from the phone to their mobile phones. By combining a state-of-the-art IP phone, an advanced video conferencing solution, and the Android operating system, businesses throughout the world can now use one IP Phone for all communication and productivity needs. Contact for other shipping options.